WWII Navy PC shows Compass This is a World War II 1943 Black and White Glossy Photo Postcard of the U.S. Naval Training Station at Great Lakes, Illinois. Never been used. 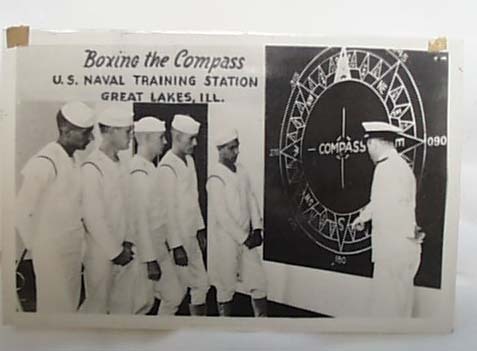 Features: Shows trainees and instructor facing a big compass and it reads, Boxing the Compass, U S Naval Training Station, Great Lakes, Ill. 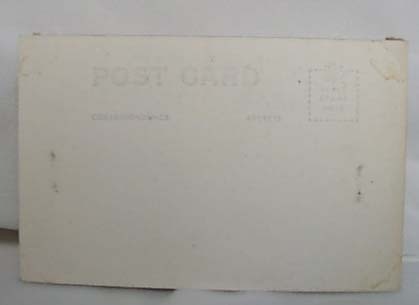 This postcard has been in a scrapbook. On the upper right hand corner and on the upper left hand corner there are small pieces of tape that I believe could easily be steamed off. They each measure approx. 1/4" square. In excellent condition. Measures 3 1/2" by 5 1/2"
Items Similar To "WWII Navy PC Compass 1943 Great Lakes IL"